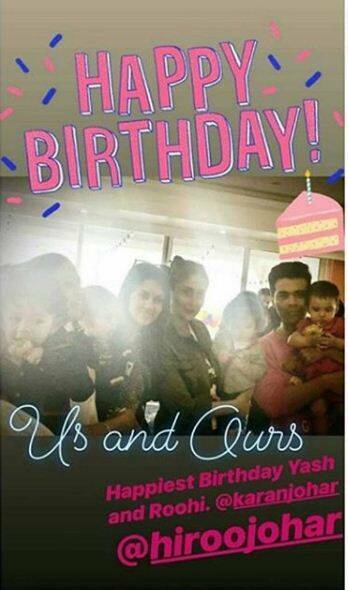 Karan Johar organised a party for his twins Yash and Roohi who turned one on Wednesday and the guest list had Alia Bhatt, Kareena Kapoor Khan, Shah Rukh Khan and Sidharth Malhotra among others in it. Rani Mukerji, Kareena Kapoor Khan, Alia Bhatt and Sidharth Malhotra at Yash and Roohi’s birthday party. When Karan Johar throws a party, the entire B-town turns up. But the party organised on Wednesday was different. It was for his twins Yash and Roohi who turned one yesterday and the guest list had almost all celebrity babies in attendance. From Kareena Kapoor’s son Taimur Ali Khan, Rani Mukerji’s daughter Adira to Shah Rukh Khan’s little star AbRam, all came to ring in Yash and Roohi’s special day. Other than the kids, it was Alia Bhatt whom he loves dearly who came for the party. Alia even shared an adorable picture of Karan’s kids on her social media account and addressed them as her ‘siblings’. Karan’s another protege Sidharth Malhotra gave an insight into the intimate party as he shared a photo of him with Shweta Bachchan wearing a customised jersey for Yash and Roohi’s birthday. He wrote along with the photo, “Team Roohi n Yash #jerseygang #birthdayparty.” Kareena and Rani posed with Alia Bhatt in the photo shared by Karan with the caption, “#girlssquadgoals.” Varun Dhawan too showered his love on Karan’s kids as he posted a photo with Yash. As Taimur noticed paparazzi, he was all smiles and it seemed as if the Kareena’s baby boy loved all the attention. On the other hand, it was AbRam who looked much comfortable in daddy Shah Rukh’s lap as he came for the party twinning with dad in white. Rani Mukerji and new mom Soha Ali Khan were also spotted reaching Karan’s residence for the birthday bash.